Years ago, I started drinking cold brewed coffee. Why? When I started brewing (beer), I learned that adding hops at different times during the boil produced different chemical reactions – either releasing bitterness, flavor, or aroma. This got me wondering – Could the same apply to coffee? Sure enough, after a little bit of research, I came to find out that cold brewing coffee provides a completely different profile than that of traditionally brewed (hot) coffee. Brewing coffee in hot water causes the grounds to release oils, these acidic oils are what gives coffee its bitterness. Cold brewing coffee on the other hand, can take 12-24 hours, but is done at room temperature. Thus, rather than changing the profile of the coffee through chemical reactions, flavor is literally “infused” into the water in which the coffee brews at room temperature. When you cold brew coffee, you aren’t making a cup or pot of coffee, but rather a coffee concentrate. This coffee concentrate that is produced from cold brewing can be nearly 70 percent less acidic than hot brewed coffee. The reduced acidity makes makes the coffee easier on the stomach and healthier for teeth. Not only that, but you’re getting a smoother, richer coffee taste. Cold brewed coffee will maintain its taste and flavor profile and not taste like stale day old coffee. Cold brewed coffee concentrate has never been hot, so its chemistry doesn’t change as it cools, meaning its flavor will not change over time. That is the best part… cold brew coffee concentrate can stay fresh for up to 3 weeks! The cold brewing process makes a very smooth, non-bitter coffee that is great for iced coffee. Cold brewing can also bee used for hot coffee – after cold brewing, simply combine the coffee concentrate with hot water – I personally do about 1:2 ratio of cold brew coffee concentrate to water (1/3 coffee, 2/3 water). How to Cold Brew Coffee? Cold brewing coffee is easy, all you’ll need is your coffee grounds of choice and a simple cold brew system – Toddy makes a great one. Lastly, if you’re looking to serve iced coffee on tap (full article to come), cold brewed coffee is the way to go. Why? Because with most things that are served on tap, they’ll be stored in a keg (potentially for extended periods of time). If you put hot brewed coffee into a keg, its flavor profile will change as it cools and in the following days. Cold brew coffee maintains a consistent flavor profile and can be kept in a keg for extended periods of time. I keep my cold brewed coffee in a 2.5 gallon keg, but there are plenty of options for storing your cold brew coffee in kegs. Combine coffee grounds and water inside your Toddy. Let this sit for 12-24 hours at room temperature. Drain the coffee concentrate through the filter into your container. Keep the coffee concentrate refrigerated for 2-4 weeks. You have high quality coffee on hand at all times now. When serving, dilute with water. I typically heat water in a teapot. I’ll pour 1/3 cup of coffee concentrate and add 2/3 hot water from the teapot. I’ve found that when using coffee concentrate, I use less sugar and less creamer and enjoy much more natural coffee taste. Stay tuned on our future articles about creating cold brew coffee, as well as serving iced coffee on tap. We’ll also explore creating a homebrewed beer using coffee concentrate rather than coffee grounds. 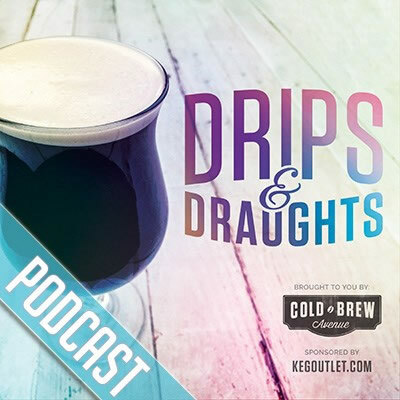 Want to learn more about cold brew coffee and serving coffee on draft? Check out our free ebook The Ultimate Guide to Cold Brew Coffee and Serving Coffee on Draft. From brewing small batches to large batches and from serving coffee over ice to nitro coffee using a stout faucet, this book has something for everyone! Photo from puuikibeach, with Creative Commons attribution.